The third week of banding continued where the second week left off, closing early due to the heat and capturing a relatively small number of individuals (less than twenty). Although we didn’t band many birds on the 30th, we did have seven recaptures of five species. The highlight was weighing a Willow Flycatcher that we had previously banded on 8/25 and discovering that it had gained 4.4 grams, or the weight of 1.5 Ruby-throated Hummingbirds, over the course of five days! We can’t emphasize enough how much we love seeing fat birds on migration and watching this small flycatcher fly away from the station equipped with enough “fuel” for its long-distance migration was simply beautiful. Knowing that it had gathered that important fat/fuel here at the Meadows made it even better. The last day of August brought some relief to the heat index in the form of thunderstorms and NE winds, which caused us to open a half hour later than normal; it also brought us a decent catch of migrants. We banded 62 individuals of 15 species on 8/31, with American Redstarts once again being the most numerous. The highlight was a Wilson’s Warbler, one of our smallest warblers, and a species that breeds to the far north of us. They don’t often stay still long enough in the field for a decent look at them through binoculars so, it was a real treat to see one up close and in the hand. Despite winds turning back to the SE on the 31st, the first day of September was our second busiest day of the fall banding season to date. We banded 109 individuals of 14 species. We saw a nice hit of American Redstarts on the second round and a good showing by Northern Waterthrush throughout the day. The highlight was catching five Eastern Kingbirds in the field nets. We had been watching groups of them foraging relatively close to our nets for several days but, had yet to capture any. It was interesting to see the difference between the adults and this year’s young up close. Not only that but, we had both an adult female and an adult male to examine in the hand, the difference in the sexes being measured by the shape of the outermost primary feather. September 2nd we closed early due to the heat index reaching 100F by 10am. Despite the early closing, we banded 57 individuals of 12 species, most of which were American Redstarts and Northern Waterthrush. There was no banding on Labor Day, September 3rd, and September 4th & 5th we closed early again due to the heat. The evening of the 4th saw NW winds and the radar was lit up so, we were all prepared for a big morning on the 5th. Unfortunately, with banding a total of 21 individuals that day, we believe that many of those birds seen on the previous night’s radar had moved on past the area. We did have two awesome highlights though, our first Mourning Warbler and Northern Parula. Overall for the week we banded 298 individuals of 28 species. 18.5% were After Hatching Year (AHY) birds, which includes 1 Gray Catbird that was still undergoing its 2nd prebasic molt. 81.5% were Hatching Year (HY) birds. We had seventeen nets open for six days and a total of 461.75 mnh. Our birds/mnh for the week was .64, a slight decrease from last week’s .70 but, still a decent showing, all things considered. Top species banded was once again American Redstart with 90 individuals. Northern Waterthrush came in second for the third week in a row with 85 individuals banded, followed by Common Yellowthroat with 24 individuals banded. 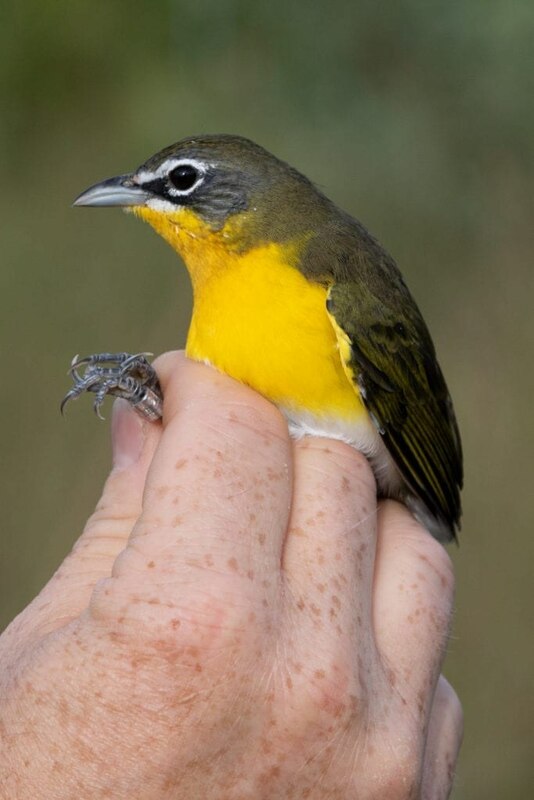 We recaptured 27 individuals that we previously banded, of which 92.59% were neotropical migrants. We are still seeing weight gain across all non-resident species, unless they are currently undergoing their prebasic molt (ie, GRCA). As previously mentioned, the Willow Flycatcher that gained 4.4 grams was a real treat. We also recaptured three Yellow-breasted Chats, all which showed decent weight gain, with one adult male weighing 5.1 grams more than he did when he was originally banded. He was super handsome and squishy and we wished him the best of luck on his journey to his wintering grounds. We suspect that he may have been a local breeder due to the fact that he was still actively molting his remiges when we first banded him, if this is the case, then there is a decent chance that we may recapture him next year. As exciting as some of our same-season recaptures have been, the thought of processing our first returns next season is even more so.